We chose EstOffice because it is very simple for our sales force to use. The presence of a non-editable history that displays all operations with apartments allowed us to solve numerous controversial issues. Overall, the level of employee responsibility has increased. We looked through many CRM systems when choosing a solution for our sales team. EstOffice software appeared to be the easiest to understand and work with. It has all we need, and nothing extra. Besides, EstOffice constantly updates and becomes even more convenient. It took us a day to make the decision to buy EstOffive, and we didn’t regret it a single second. Sales team operations became transparent. We managed to reduce the load of info-requests from real estate agencies by giving them access to our stock via a public link. An online stacking plan for Real Estate sales teams to bind leads to the apartments of certain types. It allows to have a request log for a particular type of flats and use "Interests" profile to automate the process of selling company's units. 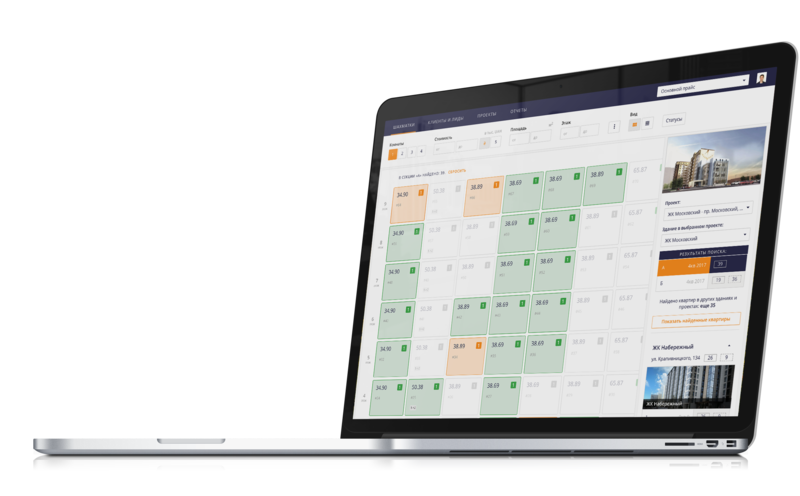 A complete CRM for Real Estate Sales teams: Stock Manager, an online stacking plan, and a CRM module – all in one end-to-end product. CRM module provides one of the simplest user interfaces and outstanding customization capabilities. A browser plugin by EstOffice allows to integrate functions for Real Estate sales into your CRM. The ‘Find matching apartments’ button will appear in the lead card in your CRM. As well as a full log of what this lead booked, purchased, was interested it. Three years ago I made a mistake and deleted a section of a certified building from a set of stacking plans. There were two 3-bedroom flats in it, each at the price of about $70,000. We discovered this mistake a year later, and, naturally, the flats were sold quickly. The profit the company could have received by performing a deal earlier and placing the funds to a deposit comprised about $14,250. During the economical crysis the majority of our flats ended up in barter deals with suppliers. In time the chief management altered its agreements, but since nobody was keeping an eye on the stock, the apartments remained in barter. As a result, liquid apartments simply were not offered to our clients and our sales were low for a few months in a row. During my first month in a Sales Department, I kept distracting my colleague to clarify the availablity status of units. Our printed stacking plan was full of messy notes made in pencil by other sales executives. I usually tell my leads only about apartments that are free for sure and have no marks on them to avoid making a mistake and booking an occupied flat. When people ask me to send information about an apartment to their e-mail, I tell them to go to the website and check it there. Having a constant flow of calls and prospects coming by, I simply cannot afford spending time on collecting info about the apartment. Especially when a client is interested in 2-3 or more apartments in different facilities at once. When I began working in a Real Estate sales office, I experienced a culture shock. Reservations and client information were recorded on paper grids. A folder with grids was passed from hands to hands. Due to this I often could not inform a client about the availability of an apartment since I had to wait for another salesmanager to finish working with the grid I need. Our company pays 2% comission to Real Estate agencies for every deal they took part in. As for us, employees, we only have our salaries. I send some clients to an agent I know to perform the deal through them and receive a part of the compensation agency receives. More order in the sales process. More sales this month. During the next recession. Always. Something went wrong. Please, update the page and try again.